Dental Implants help replace missing teeth and have now been around for almost 50 years. They can replace teeth lost due to trauma, dental decay, gum disease or naturally missing teeth. Once placed into the jaw bone they can support either a false tooth/bridge or denture. The titanium implants integrate with the jaw bone and can provide as much strength and stability as regular teeth. We can replace single teeth with a single dental implant or many teeth with more implants with dental bridges or dentures. They currently have very high success rates especially in non-smokers, currently they have a 95% success rate after 20 years in non smokers and 85% success rate in smokers. Not all implants are the same however. We use only Astra dental implants which have a proven long term track record and have numerous scientific studies proving how well they work long term in patients. Before you can have dental implants, you will need to have a CT scan or x-ray. This will determine the size and structure of your jawbone and allow your surgeon to select the correct implant for you. Dental implantation requires minor surgery; this will usually involve having local anesthesia to numb the gum to prevent discomfort. 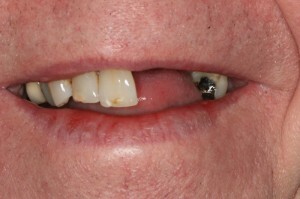 Not everyone is perfect for dental implants. Those with a history of bad oral hygiene or gum disease will need to have any disease treated and have a healthy mouth before proceeding, as active gum disease is a high-risk factor to failure. Once implants are in, oral hygiene will need to be kept to a strict standard. Additionally, smokers will be asked to quit totally or not smoke two weeks prior and after surgery to help prevent failures. What About After the Surgery? Afterwards, you might feel some slight discomfort. If this is so, over-the-counter painkillers such as paracetamol can be taken. Sometimes your dentist may prescribe you with antibiotics to reduce the risk of infection. Why have dental implants at Carisbrook dental? As mentioned the manufacturer of the Dental Implant is very important, we use Astra dental implants. Always ask your dental practice which implant system they use and the relative success rates of that system. You will find the cheaper the implant system the cheaper the quoted costs, cheap implants are not ideal as generally first time surgery is always more successful. The next most important factor is who is placing the dental implant. At our practice they are placed by Dr Rob Adams a specialist oral surgeon who is registered as a specialist with the General Dental Council. 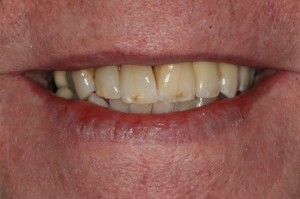 He is very experienced and skilled and has placed dental implants for over ten years. Additionally sometimes your case may be complex and you may need bone grafting or gum grafting. Again this is specialist work and Dr Adams is vastly experienced in this field, he actually teaches the subject at Cardiff dental hospital. Another important factor is who is going to make the dental crown/bridge or denture on the implants? Generally, Dr Idrees designs and makes them at our practice. He has been making dental implant restorations with Dr Adams for ten years and is vastly experienced in creating beautiful teeth that fit correctly and last. Dr Idrees and Dr Adams work as a team and work to give you the client the best possible results. Here at Carisbrook, we get sent other dentists patients to place dental implants on, currently, over 80 dentists in the northwest refer their patients to the practice for this treatment. Subject to status. Conditions apply. Representative examples: Cash price of treatment £2460; repayable over 60 monthly payments of £51.66 over 5 years. Total amount repaid £3099.60; Representative 9.9% APR.